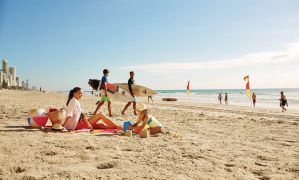 Located along Australia's Gold Coast, Surfers Paradise is a haven for surfers, party-goers, and backpackers. If you're traveling alone, it wont' be long before you find a party filled with other young travelers. There is no shortage of affordable hostels in the area where you can meet other guests and plan travel itineraries. The nightlife is always lively, and the beaches are never far away. How much do hostels in Surfers Paradise cost? Surfers Paradise Backpackers Resort is one of the most popular hostels in the area. The hostel offers plenty of activities so independent travelers have plenty of opportunities to meet other guests. If you enjoy sports, you can take advantage of the many organized events that are hosted by the hostel. These include tennis, volleyball, basketball, and table tennis. There's also a swimming pool, sauna, and plenty of common space available. If you enjoy video games, you'll find plenty of those as well. The hostel also organizes events such as quiz nights, pizza nights, and poker games. Other amenities available to guests include free wi-fi, laundry facilities, and discounts at local bars and cafes. One major selling factor for the hostel is its proximity to the beach. It's one of the closest hostels to the water. They also offer transportation to the city's Transit Centre and bus station. In the surrounding area you'll find plenty of nightclubs and shopping centers. If you're in Surfers Paradise to enjoy the party scene, then you won't find a better location. The hostel also offers a variety of room types including co-ed dorms, female only dorms, and fully furnished apartments. If you're headed to Surfers Paradise for the beach, then this is the place for you. It's just seconds from the beach and is perfect for anyone hoping to soak up some sun. It's a favorite among travelers to the Gold Coast and if you're traveling alone it won't be long before you make some friends here. The hostel has a social vibe and is a true "backpacker" experience. It is a party hostel, and you're sure to have fun here, even if you don't get much sleep. The staff and the guests all love a party and it's almost guaranteed that something will be going on while you're in town. The hostel also has all the standard amenities for guests including wi-fi and laundry. It also has a pool, a poolside bar, and a television and game room. Pub crawls are organized on Wednesdays and Saturdays, and the hostel offers discounts to many local bars and clubs. This hostel is one of the most popular in the area, and fills up early. If you're hoping to stay here, be sure and book well in advance. Like many hostels in Surfers Paradise, Sleeping Inn Backpackers is the place to come for a party. The hostel has been recently renovated and has a movie room, game room, and pool. It's a unique option because it offers apartment style rooms that have a fully equipped kitchen, bathroom, shower, and a separate living area. There are also standard dorms as well as single, twin, double and tripe rooms available. The hostel has all kinds of organized activities. There are surfing lessons, bicycle rentals, organized trips to theme parks and more. If you're traveling on your own and you want someone to help coordinate these activities, then this is a great place to stay. There are also nightly events at the hostel. These can include movie nights, all-you-can-eat barbecues, pizza nights, pub crawls, and more. The hostel is about a five minute walk from the center of town. It's accessible to a variety of sites including the Q1 observation deck, the beaches, night markets, and plenty of entertainment. Another popular hostel in Surfers Paradise, Down Under Hostel is a great option for travelers on a tight budget. They offer all kinds of free amenities that you might pay extra for elsewhere. There is free laundry, entertainment, and computer access. Unlike many of the hostels in the area, you can also bring your own alcohol on site. The hostel is conveniently located just 100 meters from the beach and it's also close to the city center and the tram station. If you're on a budget and traveling alone, then this is a great place to save a few bucks and meet some other travelers.